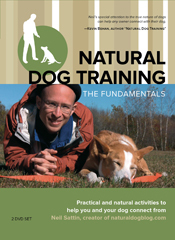 Welcome to the Natural Dog Blog store! As you can see below, our instructional DVDs are finally here - click on the DVD image for more information. Or, if you're interested in our high-quality, high-visibility, extra long training leads, you can click on THAT image (the coiled leash) for more information. We take all major credit cards, and ship US Priority Mail - meaning that you'll have your DVD set or leash within a few days (international orders take a little bit longer).